As children, we’re often the benefactors of gifts passed down by our parents, but have no understanding of their value until we are much older. These gifts often stitch together childhood memories – and help develop a fabric of love for our lives that we can return to time and again as we become parents ourselves. When I was a little girl, my mom lovingly passed along a gift of her own: she taught me to knit. From Fair Isle and Norwegian sweaters to Latvian and Estonian mittens, she could create just about anything. To see firsthand the simultaneous focus and relaxation of a knitter at work is pretty extraordinary. And while I didn’t often take the time to do it myself while I was growing up, something must have resonated about that experience – because like many traditions we inherit from our parents, I found myself returning to it years later. When my third child, Owen, was born, I knew I needed an outlet. Owen was a difficult baby from the beginning, and was eventually diagnosed with Autism at age 2 (a neurological disorder that presents with sensory processing, communication, and behavioral challenges.) Like anyone who cares for a loved one with special needs, I often felt exhausted on every level and knew that in carving out time for myself, I would have much more to give to others – most especially, Owen. Reminded of Mom’s knitting skills and how soothing those memories were, I decided to take action on the need for “me” time. It felt great to channel the younger version of myself – my inner knitter-in-training – by signing up for knitting at a local yarn shop once a week. Owen, of course, may have resented this idea; he often threw my knitting needles in the garage. But it nourished my spirit in a way that I desperately needed. 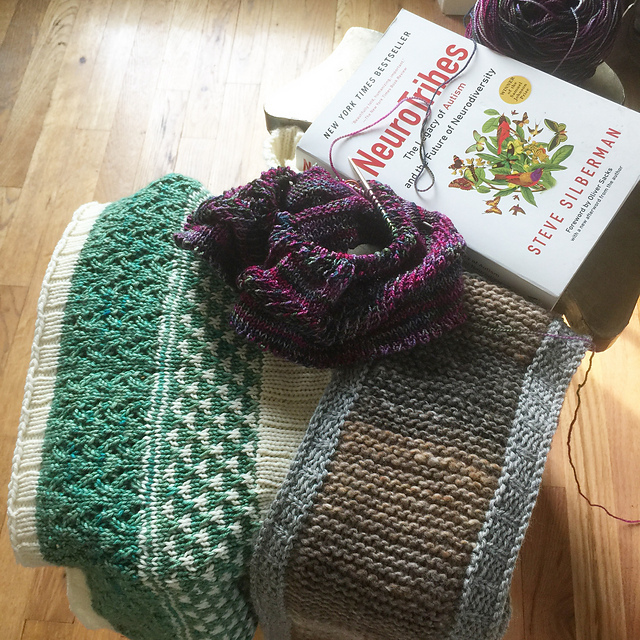 Not only has Mom’s gift of knitting brought me immeasurable joy since I rediscovered the art form as an adult, but it has allowed me to pay that joy forward as well. One of the best ways I have been able to show my appreciation to the amazing teachers Owen has had is to knit for them. In preschool, I knit hats for his teacher and all the assistants. Another year, I knit cowls for everyone. At the end of one school year, I knit scarves for his teachers. When Owen was 13, we made the heartbreaking decision to place him in a residential school. While enrolling him will go down as one of the toughest choices of my life, Anderson Center for Autism has been wonderful for Owen and our family. From Day One as we first navigated our way through our application for admission, the staff in the admissions office welcomed us warmly. They guided us throughout each step of the process, almost like Mom had done when she taught me to knit – with a gentle, quiet confidence in their craft. I was so moved by the experience that my first hand-knit gift for someone at Anderson was created for our admissions coordinator. A knitter herself, she really appreciated the time and effort that went into the cowl I made for her, in her favorite color: purple. And Owen has made progress we never dreamed possible – which means that I’ve knitted more gifts along the way for other members of his team. He learned to use “yes/no” correctly. What a big difference that has made. One of his favorite things to say is, “no please.” Yes, Anderson is great about embedding manners into their teaching. So, his first teacher at Anderson got blue hand warmers. The following year, I made his residence manager a scarf: another symbol of Owen’s positive experience there. I so thoroughly enjoyed knitting a red, black, white and grey scarf for her. That’s the thing about knitting for me, you can knit positive thoughts and gratitude into every stitch. Shortly after that I knit a cowl for his primary in the house. Bethanny taught Owen so many great skills; it felt so good to knit her a burgundy cowl. Last year, I had a bit more time on my hands and Owen was moving to a house for older boys. I knit one final cowl for a staff member who had been there since day one. Purple was her favorite color. I also knit a green and white cowl for his teacher. She is also quite amazing and has helped Owen to grow his vocational skills. I also knit a scarf for a former teacher assistant with whom Owen shares a special connection. I also like to knit items for raffles and even knit an afghan for the Gala, Anderson‘s largest fundraiser of the year. That is now over in the Netherlands and framed as art. It is so gratifying to be able to do something I enjoy and raise money for the school that has made Owen’s life–and ours better. Every time I take out a needle and start a project for someone at Anderson, I’m reminded of my son’s progress. This year I am knitting hats for Christmas. They are a surprise so I have to guess what color each recipient might like. But I continue to knit appreciation and love into each stitch. And when I consider this gift of knitting that my mom gave to me, I think about each of these projects as timepieces. They represent where Owen has been, and what he has achieved. What could be more meaningful than that?